Closets tend to be a catch-all for clutter, which causes them to become some of the messiest areas in any home. As soon as the closet door is closed, it is easy to forget about the mess inside. However, finding what you are looking for in a disorganized closet can seem to take forever, and many organizing solutions only seem to work for a few days before the closet falls into disarray again. 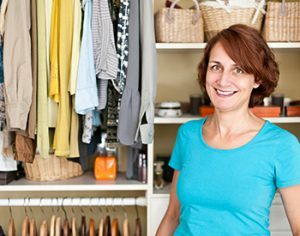 If you feel like you are constantly fighting a cluttered closet, then there is still hope that you can find an organization method that works for you. Not everyone has the budget or space for an elaborate closet makeover but, luckily, there are plenty of inexpensive solutions that do not take up a lot of room. Whether you are dealing with a messy closet in your bedroom, living room, entryway or any other area of your home, finding the right organization solution will help you maximize the space and make it easy to find exactly what you’re looking for right away. Learn the nine secrets to a more organized closet below. Do not make the mistake of buying a matching set of storage bins before you have even begun organizing. While it may be fun or motivating to pick out a brand-new set of boxes to keep your stuff in, there is no way to know how many boxes you will need or what sizes you should buy until you have assessed your organization problem fully. Save buying storage solutions for your home until you have sorted through items. This may seem extreme, but the only way to truly assess the problem at hand is to look at everything you have got in the closet. This is especially important when dealing with clothing because you are bound to uncover a few shirts or coats that you forgot existed. Before you think about putting anything back in, organize your items into piles of things you plan on using or wearing again and things that you want to donate. If you haven’t used or worn something in over a year, then chances are you won’t miss it if you donate it. Once you have everything laid out, you will be able to gauge how many boxes or bins you need to keep all of your items tidy. After you have a storage system in place, it is important to label each box clearly and keep everything in its designated place. Labels should be large enough that you can read them when they are up on a shelf and specific enough that you can find exactly what you are looking for on the first try. Once you create a label system, make sure everything is stored in the correct box or bin after using it. If your closet just has a rod with a single shelf above it, then you are missing out on a lot of storage space you probably did not know you had. Rather than hanging all of your clothes on the rod, see if you can fit a small vertical shelf or dresser on one side of the closet. This will allow you to keep folded items in your closet as well. If you have a single shelf with a lot of space above it, then consider installing a second shelf to double your room. Depending on the style of your closet, you may even be able to find some storage space on the back of the door. Installing hooks or baskets on the back of the door will allow you to store bags and smaller items with ease. Before hanging anything inside the door, make sure it won’t interfere with the door closing securely. In any closet, some items will be used more frequently than others. It makes sense to store the most-used items on the middle shelf or at eye level so you can grab them with ease. Things you use some of the time will be best left on the floor or the bottom shelf, while seasonal items or things you rarely need to use should be kept on the top shelf. When it comes to clothes or linens, dividers are a great way to keep piles of folded items from tipping over. Dividers allow you to stack similar items as high as you want, which is great on long shelves that have a lot of overhead room. However, to avoid spending too much on your project, wait until you know how many dividers you need and research which type of storage solution works best for you. If you keep a lot of items on high-up shelves, then putting them away can seem like a pain. However, by keeping a step stool or ladder in your closet you would not have an excuse for not putting your items away. A stepladder can easily be tucked into a corner or hung on a hook inside the door. If you organize well, then you should not have to completely reorganize anytime soon. However, that does not mean you can walk away from your closet and expect it to stay looking perfect. Dedicate a few minutes each week to tidying up your closet and keeping the clutter to a minimum. Use this time to put misplaced items back where they go and to take out anything you decided you no longer want. If you are like most people, then your organization issues might stem from having too much stuff in the first place. Even an organized closet can look cluttered if it is filled to the brim with things you may not even use. Not only does an overfilled closet look cluttered, but it is also harder to access your items and harder still to remember everything that you have stored inside. Once you have organized your closet to your liking, make it a point to get rid of one item or article of clothing for each new one you buy. This will help keep your closet and its contents more manageable in the long run.